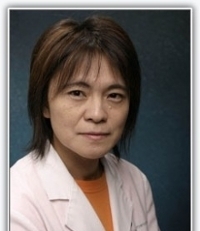 Arai earned her doctoral, master's and bachelor's degrees at Chiba University in Chiba, Japan (1987, 1984, 1982). She was a postdoctoral fellow at UCI (1989-91). Wu Y, Arai AC, Rumbaugh G, Srivastava AK, Turner G, Hayashi T, Suzuki E, Jiang Y, Zhang L, Rodriguez J, Boyle J, Tarpey P, Raymond FL, Nevelsteen J, Froyen G, Stratton M, Futreal A, Gecz J, Stevenson R, Schwartz CE, Valle D, Huganir RL, Wang T (2007) Mutations in ionotropic AMPA receptor 3 alter channel properties and are associated with moderate cognitive impairment in humans. Proc. Natl. Acad. Sci. USA, 104: 18153-18168. Montgomery K, Suzuki E, Kessler M, Arai AC. (2007) Factors affecting guanine nucleotide binding to rat AMPA receptors. Brain Res. 1177:1-8. Epub 2007 Aug 16. Arai AC,Orwig N (2008) Factors that regulate KiSS1 gene expression in the hippocampus. Brain Res. 1243:10-18. Kessler M, Kiliman B, Humes C, Arai AC(2008) Spontaneous activity in Purkinje cells: multielectrode recording from organotypic cerebellar slice cultures. Brain Res. 1218: 54-69. Suzuki E, Kessler M, Arai AC (2008) The fast kinetics of AMPA GluR3 receptors is selectively modulated by the TARPs gamma-4 and gamma-8.